SEATTLE – They were the catalyst behind a first-half surge that stunned MLB and stoked the city of Seattle. They were a collection of arms that was presumed to be a liability before becoming a linchpin. The Mariners rose to 24 games above .500 at one point this season thanks largely to starting pitchers who (mostly) outplayed their baseball cards and outclassed their competition. But now, that once sharp rotation has become shakier than ever. 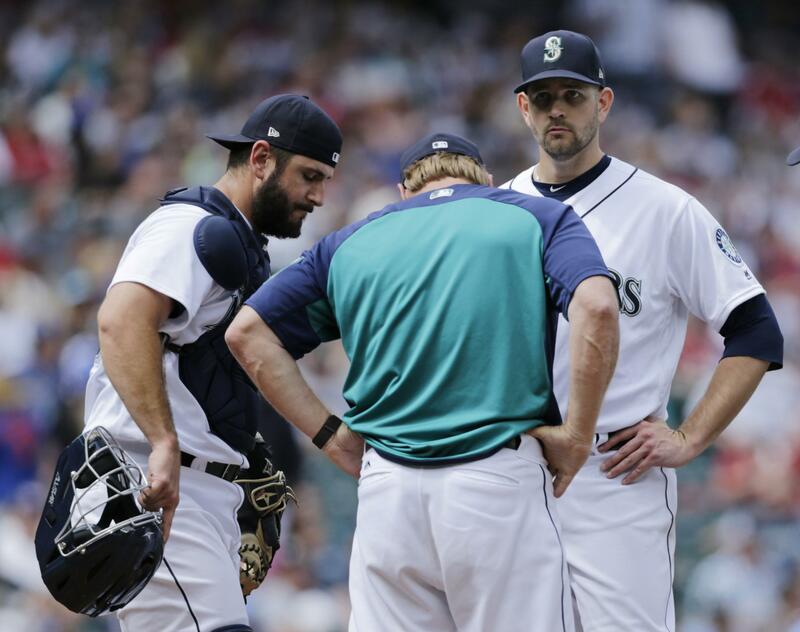 The cresting Dipoto cites is James Paxton getting hit by a line drive and going to the disabled list, Felix Hernandez posting career-worst numbers, and Marco Gonzales and Wade LeBlanc hitting August snags. It is having to call up Erasmo Ramirez to replace Hernandez, bringing Hernandez back to replace Paxton, and throwing seldom-used Roenis Elias out there for a start against the Dodgers to rest Gonzales. M’s manager Scott Servais has emphasized the importance of starting pitching since his tenure began in Seattle, generally citing it as the difference between success and failure at this level. So as the Mariners chase the Astros and A’s for an increasingly improbable playoff spot, I ask the following questions: Does this team have the starters to contend? Could Dipoto have done more to beef up the rotation? And will he make a move in this final quarter of the season? The answer to question No. 1 is … doubtful. A healthy Paxton is among the best hurlers in the league, but there isn’t a shut-down arm after that. Reliable as Mike Leake has been this season – particularly over his past few starts – a 3.90 ERA and an American League-high 164 hits allowed doesn’t speak of dominance. As for Gonzales, whose first half was the most pleasant surprise the M’s have had all year? His 145 2/3 innings are 23 more than he’s pitched in a season (majors and minors included), and he has allowed 20 runs in his four August starts. As for LeBlanc, whose first half was the second-most pleasant surprise for the M’s this year? His 4.04 ERA is regressing to his career mean, and he has allowed 17 runs in his past 20 innings. Hernandez, meanwhile, has become predictably vulnerable, and the Mariners’ offense after the All-Star break has been anemic. Putting a tombstone on this season would be foolish given how history has humiliated such declarations, but ending the 16-season playoff drought is looking less likely by the day. Could something have been done earlier, though? Could the ever-active Dipoto have secured another arm by now? It’s easy to fantasize about some of the names that could be in a Mariners uniform during this wild-card chase. Cole Hamels is 4-0 with an 0.79 ERA since going to the Cubs, J.A. Happ is 4-0 with a 2.22 ERA since joining the Yankees, and Kevin Gausman is 3-1 with a 2.00 ERA since moving over to the Braves. But when asked about the idea of attaining any of those hurlers, Dipoto’s response was concise. This is hard to argue with. The Mariners’ farm system is among the most barren in MLB. They didn’t have the capital to make a blockbuster deal, even in this “win now” window. Dipoto also mentioned how the quartet of Paxton, Leake, LeBlanc and Gonzales was the only one in the league where all four players had pitched 100 innings with ERAs less than 4.00 at the trade deadline. Ramirez, meanwhile, had been rehabbing from injuries and has allowed just four runs in 16 innings since coming up to the majors. “We didn’t see alternatives that were more appealing,” Dipoto said. What about former Tigers pitcher Mike Fiers? The Mariners passed on him on the waiver wire, only to watch him allow a mere three runs in the 18 1/3 innings he’s pitched since A’s picked him up. Could he have been an influential member of the rotation? “We didn’t view him as that kind of guy,” Dipoto said. It’s difficult for GMs to make decisions in the moment. It’s easy for the media to make judgments after the moment has passed. Right now, though, that extra boost would be nice, if not essential for the Mariners. As for future acquisitions, Dipoto said he is looking every day. But it also seems as though he is content with the pieces he has in place. It’s hard to think he can do much more with the rotation at this point. It’s harder to think what he has done is enough. Published: Aug. 25, 2018, 12:43 p.m. Updated: Aug. 25, 2018, 4:59 p.m.